This twist on a breakfast classic is sure to be a hit at your next brunch. 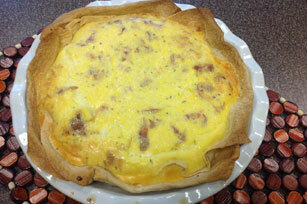 Get your day off to a delicious start with this Bacon and Egg Morning Tortilla Pie recipe. Spray 1 tortilla with cooking spray; place, sprayed side down, in 9-inch deep-dish pie plate, with 1 edge of tortilla extending 2 inches over side of pie plate. Repeat with remaining tortillas, overlapping edges as necessary to completely cover bottom and side of pie plate. Fold under edges of tortillas extending over side of pie plate. Bake 10 min. Sprinkle bacon, onions and shredded cheese onto bottom of tortilla crust. Whisk cream cheese product and 2 eggs in medium bowl until blended. Stir in milk and remaining eggs; pour into crust. Bake 45 to 50 min. or until crust is golden brown and knife inserted in centre of filling comes out clean. Let stand 5 min. before cutting to serve. This tortilla pie is equally delicious whether served warm or cooled to room temperature. Substitute 1/2 cup chopped deli ham for the crumbled cooked bacon and/or 1/2 cup chopped fresh parsley for the sliced green onions. Serve with a sliced tomato and cucumber salad drizzled with your favourite Kraft Dressing.